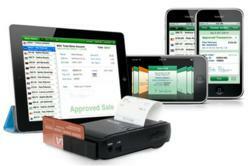 Advanced Merchant Solutions has released a complete payment solution for Apple’s iOS Devices. This solution is geared towards mobile sales professionals who use the Pocket Verifier Universal App and iMerchant hardware to swipe credit cards and print receipts. Professional Credit Card Receipts now available to iPhone and iPad Merchants. A printed receipt is still the best way to avoid card-holder pushback and to reduce chargeback fees that are usually paid by the merchant. Pocket Verifier Professional™ for iOS devices is now available with the iMerchant™; a complete payment solution that swipes credit cards and prints receipts for the iPhone®, iPad™, and iPod Touch® devices. Advanced Merchant Solutions, Inc. (AMSI) has launched a payment solution for Apple’s mobile operating system. The software, Pocket Verifier Professional, is available as a free download on the Apple App Store and is designed to work with the company’s new iMerchant Card Reader and Thermal Receipt printer. Coupled together, the Pocket Verifier/iMerchant system enables any mobile business user to avoid the high cost of “card-not-present” transactions and eases the concerns of customers by allowing printed receipts. AMSI further integrates this breakthrough system into a complete solution by packaging it with a combined merchant and gateway account, with e-commerce, and no upfront costs, no term commitments, or cancellation fees. “We have an ideal system for any business that wants to accept credit cards. Our merchants are qualified and approved upfront, which means there is no surprise ‘30-day-hold’ on payments when they process transactions. The merchant sets their own ticket size and monthly volume, and after approval, they can count on their funds being deposited on time, every time,” stated Dennis Ideue, the company’s CEO. The iMerchant is currently shipping. Its retail package features a thermal print mechanism, 2-track magnetic stripe reader, an interchangeable battery, a quick-charge adaptor, and a leather case with integral belt clip. Pocket Verifier Professional for iOS is currently available on the App Store. For more information and further inquiries, visit: http://www.merchantanywhere.com. About Advanced Merchant Solutions, Inc.
Advanced Merchant Solutions, Inc., commonly known as MerchantAnywhere, is a privately held corporation and has been both a leader and pioneer in the mobile transaction processing industry since 2001. Their solutions include software, hardware, and transaction processing for both traditional and mobile merchants. Advanced Merchant Solutions, Inc. is a Registered Visa/Mastercard Independent Sales Organization (ISO) for Columbus Bank and Trust, Columbus, Georgia, as well as a registered Apple, Microsoft, Palm and RIM software developer.